SANTIAGO, Chile (AP) — The Chilean president's efforts to squeeze political advantage from his campaign to reduce poverty have backfired, opening him up to accusations that he distorted statistics to show progress on a campaign promise. But his claim that his government has lifted one of every four people out of extreme poverty led to an embarrassing clash with a prestigious U.N. agency, which publicly distanced itself from the government's numbers. Doubts grew as well because officials let 49 days pass before explaining on Friday how they calculated the figures for the once-every-three-years household income survey. And so when the preliminary numbers arrived in July, he made them a cause for celebration. Presenting charts and graphics, he said that extreme poverty had dropped from 3.7 percent in 2009 to 2.8 percent in 2011 and that overall poverty had fallen from a stubborn 15.1 percent to 14.4 percent of Chile's 16.5 million people. "It's very good news," Pinera said then. Pinera and his backers insisted the numbers were certified by the United Nations' Economic Commission for Latin America and the Caribbean, a prestigious organization that has been helping Chile's social development ministry crunch its statistics since 1987. The Santiago-based commission does this for no other country, and its stamp of approval has been a major confidence-builder for investors in a region as volatile as Latin America. But the technical details finally released Friday night said the error margin was 0.82 percentage points. In other words, rigorous mathematicians would insist the gains Pinera has been boasting about for weeks are statistically insignificant: While it's possible poverty dropped as low as 13.6 percent of the population, it's also possible poverty actually increased to 15.2 percent. Pinera certainly knows his way around numbers: He earned a master's and doctorate in economics at Harvard University, and taught the subject for 17 years at Chilean universities while growing a fortune of more than $2.4 billion by introducing credit cards to Chile and building LAN Airlines into a regional power. A scandal blew up after local reporters showed he had insisted on announcing the numbers as a victory despite reportedly being warned personally beforehand by the U.N. agency's top liaison with the government on the survey, Juan Carlos Feres, that the gain was insignificant. The UN economists kept their silence for weeks before issuing an unusually strong statement distancing themselves from attempts to use their luster to either put a shine on Chile's numbers or attack them. ECLAC's executive secretary, Antonio Prado, belatedly clarified that the commission later agreed to the government's changes, reasoning the new questions captured the same kind of income that other questions had addressed in 2009. 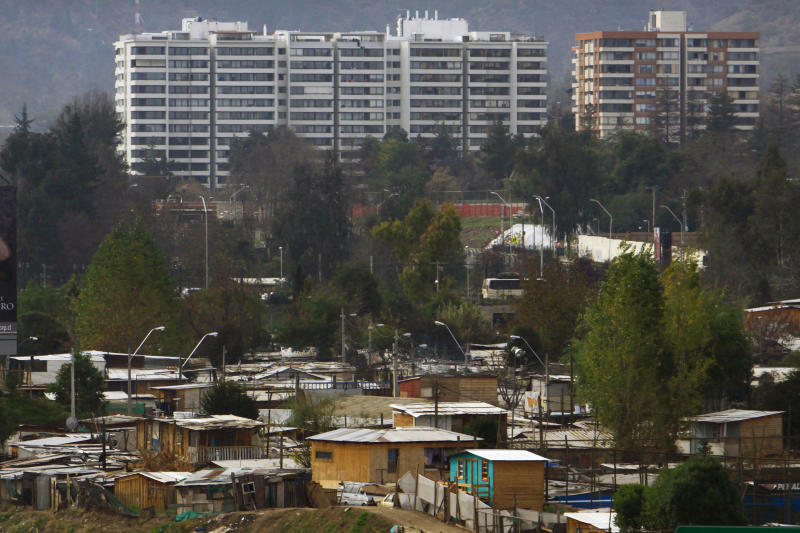 Prado also noted that because of ECLAC's own changes in methodology used across the region since 2007, its poverty numbers for Chile are even lower, showing a drop from 11.5 percent in 2009 to 10.4 percent in 2012. Pinera dismissed the criticism again last week, telling reporters that it's more important to "look at reality." "Technically this survey is well done, doesn't have problems and is comparable with earlier surveys," he argued. All governments want to show their economies are improving, but the numbers game is particularly important to Chile because its society yearns to shake off its Third World image and be seen as a developed nation. Its membership in the Organization for Economic Cooperation and Development, which includes 34 of the world's leading economies, is a point of pride for Chile's business elite. Mexico is the only other member in Latin America. Between her maid's salary and her husband's work in construction, they make $715 a month, which puts their family of four just above poverty.